Dr Gerard Unger (1942–2018) was born in The Netherlands and passed away in his home in Bussum, The Netherlands. He studied graphic design, typography, and type design from 1963–67 at the Gerrit Rietveld Academy, Amsterdam. 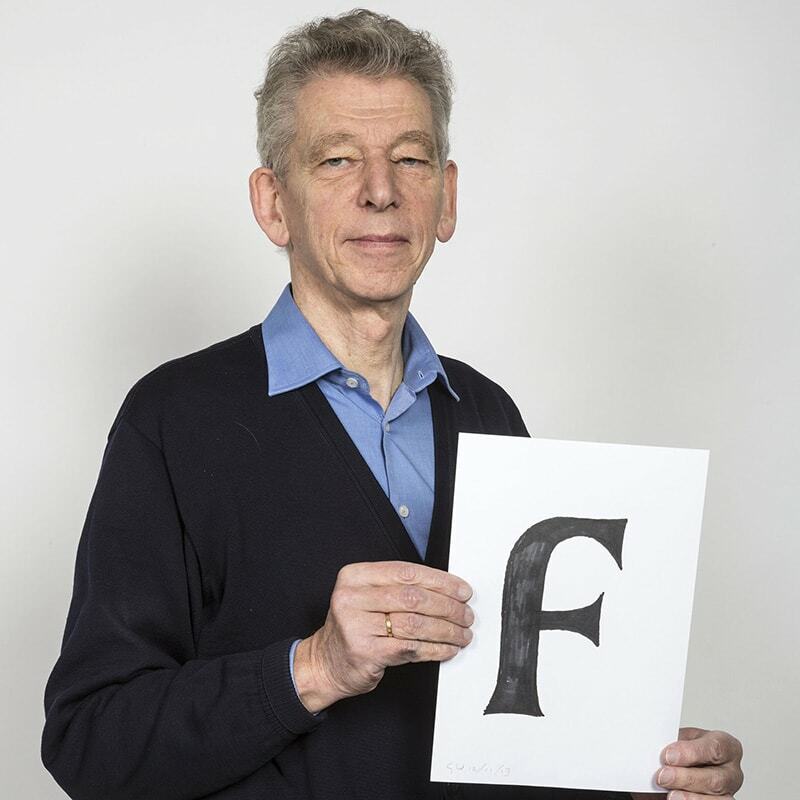 He was Professor of Typography at Leiden University, The Netherlands from 2006–2012, from which he also received his PhD in 2013. Dr Unger worked as a freelance designer beginning in 1972 and, until his death, taught as visiting professor at University of Reading, UK, Department of Typography and Graphic Communication. He designed stamps, coins, magazines, newspapers, books, logos, corporate identities, annual reports, and many other objects, as well as many typefaces. Dr Unger was awarded several Dutch and international prizes and honours, such as two honorary doctorates by the universities of Hasselt, Belgium and Tallinn, Estonia. He wrote articles for the trade press and several larger publications, such as Landscape with Letters (1989), linking the usually limited scope of type and typography with a wider cultural view. His book Terwijl je Leest (While You Are Reading) has been translated into Italian, English, Spanish, German, French, Korean, and Portuguese. Unger lectured frequently in Holland and abroad about his own work, type design, the reading process, and the related subjects of comprehension, legibility, and perception. Theory of Type Design, his final book released just prior to his death in 2018, aimed to form a functional and artistic basis for the category of type design, and garnered immediate acclaim. TypeTogether’s annual Gerard Unger Scholarship (previously, Typeface Publishing Incentive Programme) was named in his honour. This programme offers guidance and support to at least one selected post-graduate recipient, with the aim of enabling exceptional designs started during a course of study to be finalised and published commercially upon the recipient’s course completion. For scholarship details, go here. Read TypeTogether’s In Memoriam here. Dr Unger’s typefaces published with TypeTogether include Alverata, Capitolium 2, Coranto 2, and Sanserata.